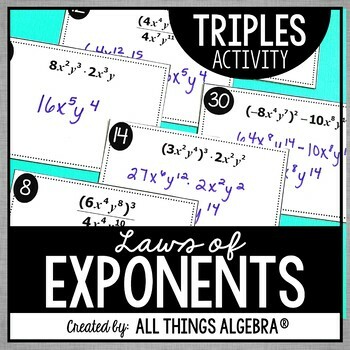 Students will apply exponent rules (laws of exponents) to simplify expressions with this “Triples” activity. Properties include the product rule, power rule, quotient rule, negative exponent rule, zero exponent rule, and a review of adding and subtracting monomials by combining like terms. Please check the preview and the sample cards to see the level of questions. 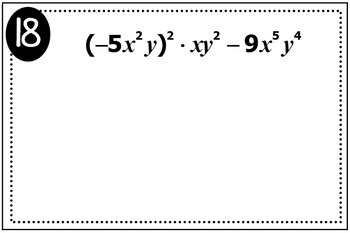 There are 30 total cards in which students must simplify the expression. There are 10 sets of 3 cards with the same answers. 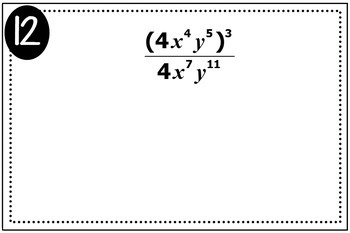 Once they have simplified them, I have them cut them out, staple all their "triples" together, and put them in a bag. An answer key is included to ensure the correct cards are matched together. For a digital version of the activity made in Google Slides, click here!